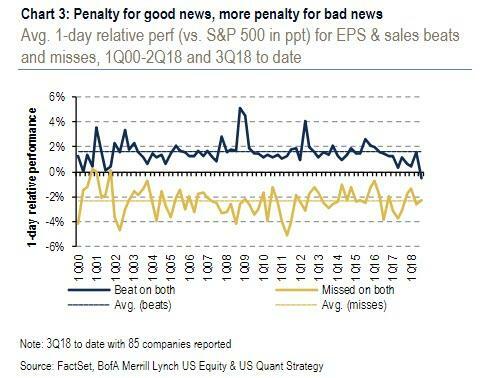 One week ago, with roughly half of earnings season in the books, FactSet and Bank of America revealed an ominous statistic about the jumpiness (or perhaps "peak earnings") of the market: in a curious twist, companies that had reported positive earnings surprises for Q3 2018 were punished by the market, with their stock price decreasing by -0.5% two days before the earnings release through two days after the earnings. Meanwhile, and as one would expect, companies that reported negative earnings surprises for Q3 2018 have an average price decrease of -3.5% two days before the earnings release through two days after the earnings. 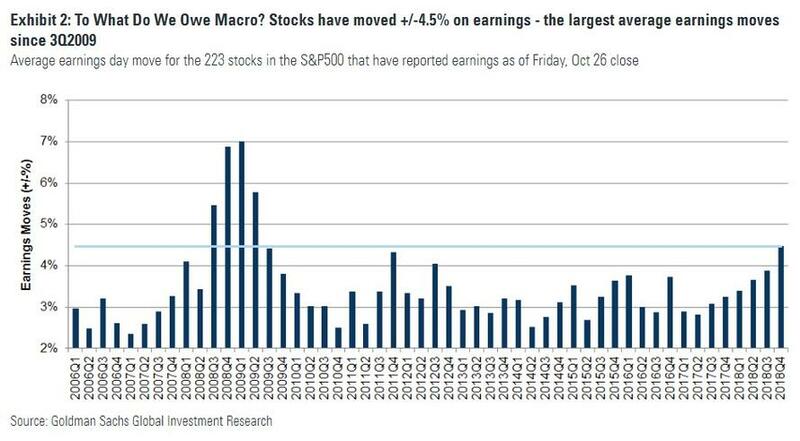 While the market penalizing companies for earnings misses is hardly a surprise, the lack of reward for EPS & sales beats is typically a later-stage bull market signal according to BofA strategist Savita Subramanian who wrote that "this suggests that the good news is priced in." Putting these market reactions in context, the only time when the market had a sub-1% relative surprise reaction for beats was in both 1Q00 and 4Q07. Now, Goldman's derivatives strategist Katherine Fogerty points out another curious statistic about the bifurcation between single name and index vol: in the latest indication of just how nervous traders are about corporate earnings, with just over half of the S&P having reported results as of last Friday, the average stock moved +/-4.5%, marking the highest earnings move since the Financial Crisis (Q3 2009). Of note, this is not due to overall market volatility because while the S&P500 was down just 2% during October 2009 (vs -7% October 2018), the average level of the VIX was 61%, substantially higher than 19% this month. When broken out by sector, communications (comprised of Internet, Media, and Telecom stocks) exhibited the least ties to macro volatility on earnings and the largest absolute moves: the average stock in this sector realized a +/-7.0% move on earnings this quarter. 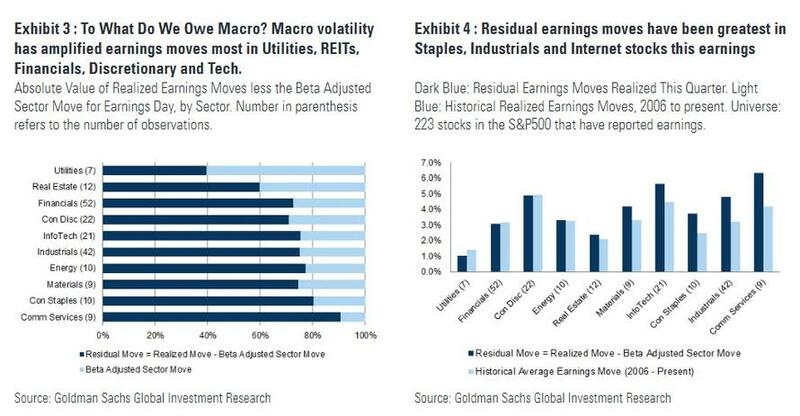 After adjusting for sector performance, Goldman calculates a Residual Earnings Move of +/-6.3%. This is 2.1% higher than the average move these stocks have realized on prior earnings reports (2006 - present). 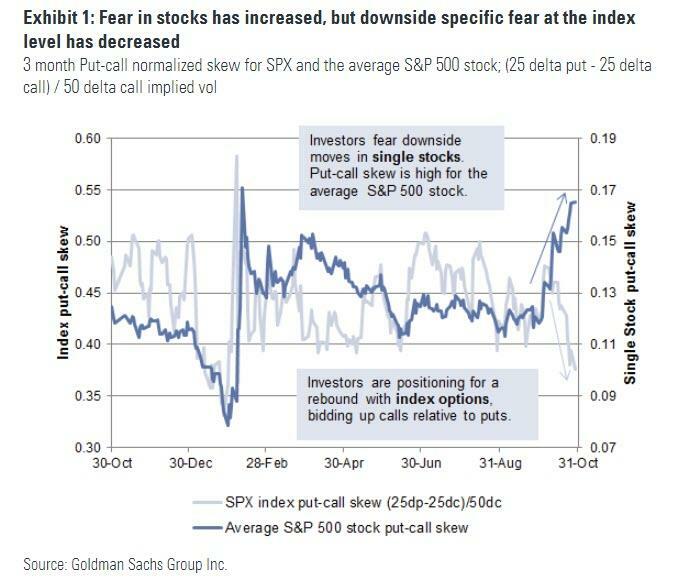 Goldman's latest observations echo the analysis made by another member of the firm's derivatives team, when on Tuesday strategist John Marshall showed that while fear has risen sharply at the single stock level "as put-call skew is now in-line with the levels following the February sell-off", suggesting that investors fear gap-moves lower in single stocks over the next three months, the same thing is not true at the index (S&P500) level, where the put-call skew has declined since early October, "implying that investors aren't seeing as much potential for a sharp sell-off from this new lower level in equities." Discussing recent conversations with investors, Marshall says that this spread in the vol world is is indicative of a divergences in near-term sentiment: "Macro investors we speak with seem focused on picking a bottom in the SPX which is oversold relative to other asset classes" while at the same time, "micro investors seem increasingly risk-averse following big earnings-day moves." Whatever the reason, the increase in earnings-day moves over the past two years, discussed here most recently in August, is continuing this quarter. Given the overall challenging tape, buying the closest out of the money one month listed put 5 days ahead of earnings and closing the day after produced an average return of 107%. This is the highest profit for this strategy since the Financial Crisis. Another trade that has fared well is buying the closest listed one month straddle 5 days ahead of earnings and closing the day after. Post crisis record earnings moves have helped drive an average return of 35% for this strategy, which isolates volatility. Given the 7% drawdown in the S&P500, buying calls has been extremely challenging. In fact, buying the closest out of the money call 5 days ahead of earnings and closing the day after has produced a loss of 36% on average. All figures exclude transaction costs. One obvious counter to the above is now that it has been publicized, the trade will no longer work. Whether or not that means that single stock volatility will also collapse now that everyone rushes to hedge it (while pushing index vol higher as hedges are pulled) remains to be seen.